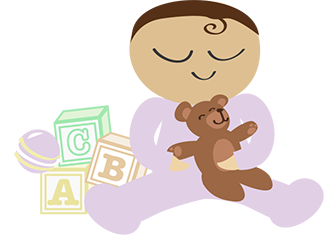 Symptoms of Edwards Syndrome can affect babies in numerous ways, and no one baby can be described as ‘the norm’. This goes for me. Some babies who survive to birth, may only survive a few short hours. Some may survive longer, but never leave hospital. Some will have serious organ abnormalities and others almost none. Some may suffer from the start, others may thrive for a while, and a few will surprise everyone. I was somewhere in the middle of all of this. I have noted below some of the key Edwards Syndrome symptoms, some I never encountered, but some I did. Kidney problems can be common in Edward’s babies. Renal failure can occur as well as kidney defects which can lead to urinary infections. This is not something I was affected by. Again, heart defects are very common. Some are more serious than others however. I had a ventricular septal defect as well as a double outlet right ventricle, and a suspected narrowing of the aortic valve. My heart condition was pretty serious. When I would breathe you could see my chest slightly recessing into my rib cage. However, as far as we know, my heart did not actually fail. This is where your child might suffer from pauses in breathing. I was fitted with an Apnoea alarm when I was in the children’s hospital, which I wore for a while before Mummy and Daddy finally removed it. I had almost no apnoea’s throughout my life until the end. They started one night without warning, and once they started it was an unbreakable cycle. Although I was looked after at home, I actually went out very little, so I do not know if this is something which might have affected me. This is a hole in the roof of the mouth. Some Edwards babies are born with cleft palates, but I was not affected by this. 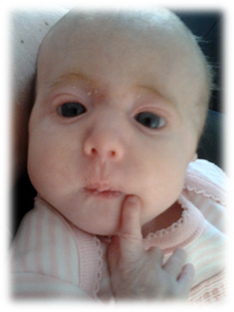 I have talked in ‘Cerys’ journey’ about the feeding issues I encountered. Feeding issues dominated my life, and no solution was actually found. I will summarise this though in the next section ‘Cerys & Feeding Issues’. Reflux vomiting is something I suffered with, and received medication for. Initially with the feeding tube I suffered no colic at all, but I did once I moved to bottle feeding, and it was very uncomfortable and made me cry a lot. I only really had this when I moved away from expressed milk to formula. I was given some lactulose which sorted things out for me, and I quite liked the taste of it as it was nice and sweet!!! These are mostly caused by the eyelids not developing, but I was not affected by this. My eyes were quite gammy at the start, but a few eye drops soon sorted this out. My mental development was extremely slow. I did not respond as normal babies would do. Apart from one brief moment on my final day, I never smiled. I was unable to interact with toys, although I did like looking at anything that was bright and sparkly. I never held anything, and I never really followed the sound of my name when it was called out. I never had any until my final day. What a wonderful thing to have put together, so helpful for those of us who had cause to be looking for answers about Edwards, and such an extraordinary tribute to your beautiful daughter.